If you want to understand why modern American life is so irredeemably, inescapably litigious -- why Washington and Main Street alike bobble atop an ever-expanding sea of red tape, why the NCAA’s approximately 10,945-page rulebook covers allowable bagel toppings, why the two sweetest words in the English language are neither free parking nor de-fault, but rather billable hours -- a simple, two-word explanation will suffice. In case you haven’t heard, here’s what happened: Holding the ball and leading 41-34, the Giants lined up for the final play of the game in their “victory” formation -- the one where Eli Manning takes a knee, and everyone else gets an early jump on post-game prayers and handshakes. No harm, no foul, good job, good effort. Only Schiano didn’t play along. Instead, he pretty much ordered a Code Red, directing his defensive players to rush the quarterback and knock him on his keister. Which they did. With extreme prejudice. Which in turn prompted New York coach Tom Coughlin to lambaste Schiano on the field -- note: Coughlin was genuinely irritated, and not just reverting to his default mode of expression -- followed by Giants players calling the play dirty, pundits and writers crying foul and almost everybody noting that, if nothing else, the hard-charging, play-to-the-whistle Bucs egregiously trampled the unwritten rules of the sport. By violating the NFL code, Schiano came off like a bit of a jerk. By ordering a kneel-down rush, he came off like that Japanese soldier who fought World War II into the 1970s, attempting to win the battle despite losing the war. The odds of Schiano’s gambit helping his team earn a victory were roughly the same as the coach’s face revealing itself on a tortilla in Mexico. The play could have gotten someone hurt. It may have set his own players up for future retaliation. At best, it was the ploy of an overly serious high school coach, hypnotized by his own never-say-die, Spartans-at-Thermopylae halftime speeches and/or the Successories posters cluttering his office; at worst, it was a 15 score on the revised Hare Psychopathy Checklist. Still, I can’t say I fault the guy. I mean, sure: Schiano didn’t play nice with others. He was fake-macho, the sideline answer to an Internet Tough Guy. Only he’s not the problem. The problem is unwritten rules, which are problematic for one very good reason: They’re unwritten. Non-codified. Not binding. They exist to be twisted, ignored, and yes, flouted. There are no established mechanisms to enforce them, save for three dubious options: a) social approbation, b) vigilante paybacks, c) Tom Coughlin’s angry spittle. Fail to put stuff in writing -- fail to spell out every permission and prohibition in specific, excruciating, obsessive-compulsive detail, backed up by the threat of costly litigation -- and this is what happens. This is always what happens. Somebody somewhere looks for an edge. Somebody somewhere takes advantage. It happens in sports: See teams tanking for favorable draft position and playoff seeding. It happens on Wall Street: See the recent financial crisis, in which megabanks nearly wrecked the global economy via ethically dubious -- but not illegal! -- financial gambling. (It happens in personal finance, too: See Mitt Romney’s tax returns … OK, bad example.) This phenomenon is why we have prenuptial contracts and James Joyce-shaming iTunes terms of service agreements and brown M&M-banning rock star backstage riders. It’s why the Ten Commandments were delivered via stone tablet, and not during a TED talk. A suggestion is not a statute. All of us know the difference. Sooner or later, all of us act accordingly. Some claim that what sets us apart from other animals is our use of tools. Au contraire. Even sea otters -- a species that has neither reached the moon nor invented the beer cozy -- use stones to crack open the shells of their prey. No, what makes us unique is our staggering imagination and creativity, mostly when it comes to ostensibly obeying laws while utterly circumventing their spirit. We are homo loopholeus. Draw up a complex collective bargaining agreement intended to help NBA teams re-sign their own restricted free agents, and Houston Rockets general manager Daryl Morey will find a way to land Jeremy Lin with a poison pill offer sheet; establish a collegiate athletic cartel rooted in monopolistic restraint of trade, and programs will find a way to compensate their talent by funneling cash through bogus -- but not illegal! -- recruiting services; create a gentleman’s agreement to ease up on kneel-downs, and Troy State will jump the offensive line and recover a fumble by Oklahoma State’s Brandon Weeden, a seldom-used tactic that is completely within established rules. Now, you can argue that Tampa Bay pulling the same trick against New York was underhanded. That it was a rotten, no-good, very-bad-faith thing to do, even if the league office subsequently said it was kosher. And you likely would be right. It felt cheap. It smelled pretty desperate. That said, I kind of admire Schiano. Not because he was encouraging his team to “fight until they tell us game over,” or because he was somehow attempting to change the culture of a losing franchise. (Is any sports term more overused, maddeningly amorphous and totally useless than “changing the culture”? Honest question. Here’s what “changing the culture” of a sorry team usually entails: hiring better coaches and players.) I admire Schiano because he was pushing the envelope. Trying to get over. Coloring inside the lines with spray paint. Sometimes, sidestepping the rules leads to genuine innovation; sometimes, driving through loopholes is the first step toward closing them; every now and then, exploiting regulations makes us take a good, hard look at our values and priorities, reevaluating why we have said regulations in the first place. And all of this is valuable, both for society as a whole and the lawyers who get paid to squabble over the fine print. Particularly when it comes to unwritten customs -- like kneel-downs -- that aren’t even full-blown, agreed-upon, fine-printed laws in the first place. Usually, there’s a reason for that. 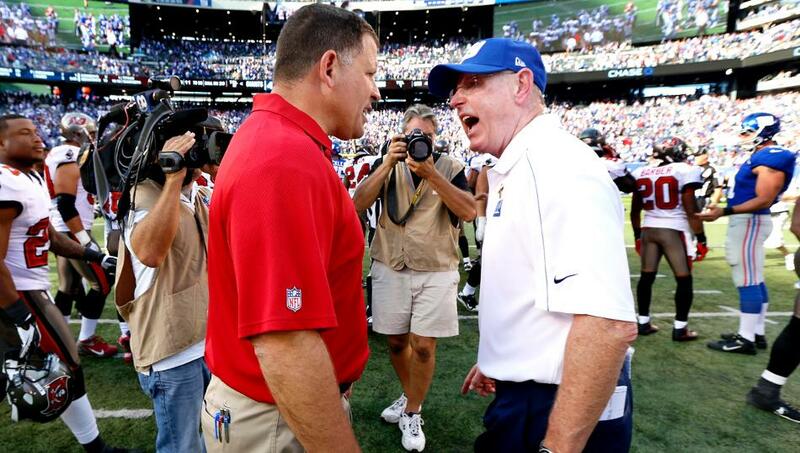 After the game, Coughlin remained apoplectic, all but calling Schiano nuts for endangering his players. “You don't do that in this league,” he told reporters. “You don't jeopardize the offensive line, you [don't] jeopardize the quarterback.” Right. Of course. If there’s one thing professional football doesn’t do, it’s place the health and welfare of its participants in jeopardy.